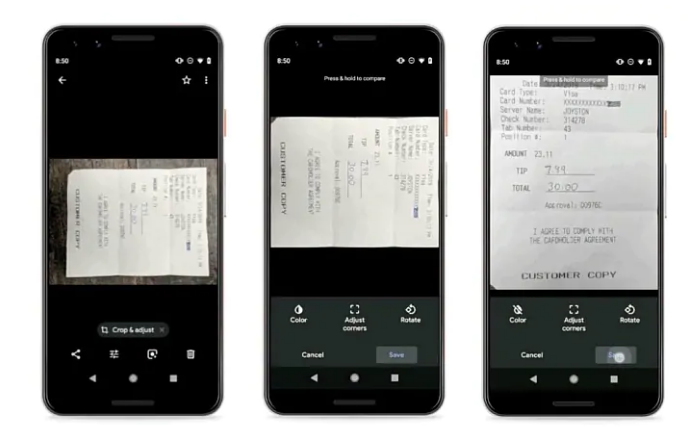 Google has added a new feature in its Photos App that immediately crops any documents or receipts after you scan them from your phone. This is extremely useful as it usually takes a lot of time an effort to resize and cut the portions that are not required from the scanned image. A tiny pop-up window shows up once you scan the document which says “Crop and Adjust”. If you press this option, Google Photos will do the painstaking process of cropping for you in a second. Once done, you will have the perfectly cropped image in front of you on the screen. Apart from this, this new tool can also rotate and brighten up the image as per your choice automatically without you having to do much. The app will show you a Crop & adjust pill at the bottom of the screen once it recognises the document captured. Tapping the pill brings three options, namely Colour, Adjust corners, and Rotate.While the Colour option essentially adjusts the colours of the image to enhance its readability, the Adjust corner option allows you to remove the background and clean up the edges of your document. Both these options seem to use some AI inputs to enhance results. You can also press the Rotate option to manually rotate the frame. This feature will start to roll out on all Android device having Google Photos App by this week.